Living in a disaster-prone country like Indonesia, I’m not a stranger to scenes of grief, but the devastation brought by the recent earthquake and tsunami in Palu was unbearable to fathom. When the earthquake hit our place, people were panicking and running for safety. I heard voices shouting “tsunami” repeatedly – warning everyone to go to higher places. It was noisy and people seemed confused about where they should go. 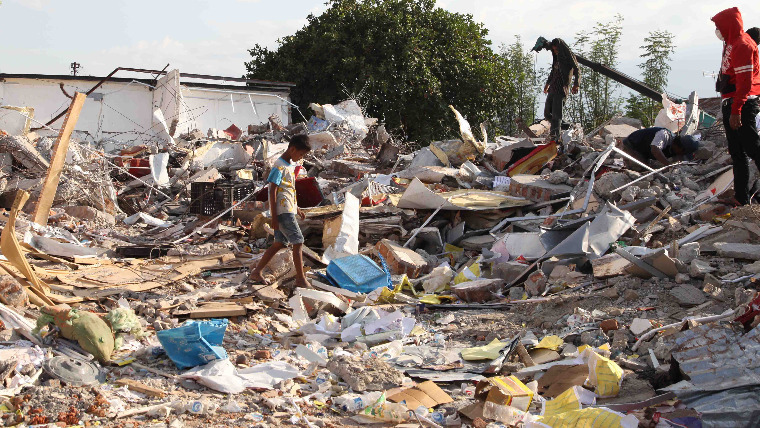 After the quake, huge waves came rushing through the villages of Palu – wiping out everything. While these scenes were unfolding, I sat with my colleagues at a World Vision office in Palu - praying, crying, and feeling helpless in one place. It was shocking to see how the earthquake and tsunami swept away everything - even houses and tall buildings with strong walls came crashing to the ground. We still don't know the extent of the damage in some of the most remote areas, as many communication lines are down. There were limited supplies of food and clean water. We heard that people resorted to looting the stores, grabbing whatever they can for survival. Our place was in a total chaos. I saw a lot of children with items salvaged from the ruins of a family member’s house. Desperation was visible everywhere. Thankfully, our office has a huge open space for families to stay temporarily. We immediately set up spaces for infants, children and families who had lost everything. 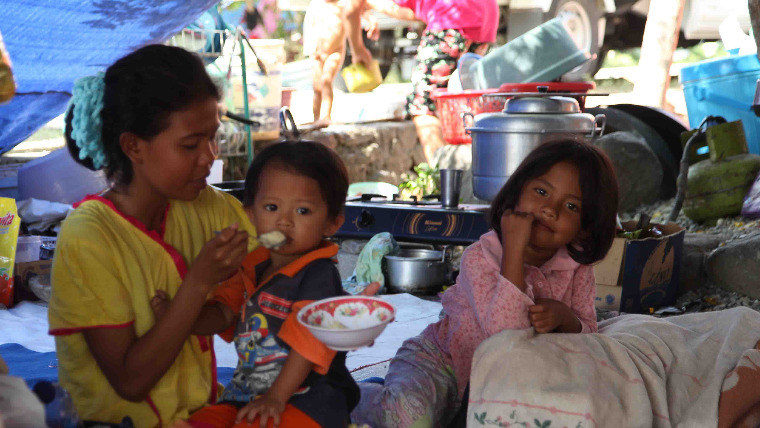 Many of them were children under five years old, pregnant women and new mothers. There were around 200 families sharing the space. If you'd like to donate to our Indonesia Tsunami Appeal, click here. Despite our worries, Wahana Visi staff immediately provided the families and children with food, although the supplies were limited. We cooked some local food with Moringa leaves to provide better nutrition, especially to those most vulnerable. It was a relief that our staff from Jakarta arrived immediately in Palu, and we set up our first Child-Friendly Spaces quickly. Many of the buildings were destroyed, so we are working inside a huge tent so children will feel safe, especially during aftershocks. Nevertheless, I’m relieved to see children smiling again and somehow their smiles ease my fatigue. Seeing the devastation and seeing the needs of people in Palu, I feel I have a lot of things to do. I’ve been deployed here since I first joined Wahana Visi Indonesia, and the people in Palu have a special place in my heart. I share my strength with my colleagues who are working almost 24/7 in order to support the needs of the affected families. Our team is conducting a joint distribution with the government, and we've witnessed how families and children are in dire need. However, in the coming days we will be distributing blankets, family kits, and shelter kits to the affected families. Our response will focus on providing food, water, health, shelter and child protection assistance with an initial target of 80,000 individuals. I heard today that the death toll has increased to more than 1,400, with 2.4 million people being affected. The rescuers are trying their best to reach all affected areas, and Wahana Visi Indonesia is trying our best to deliver aid quickly despite many challenges. With all the loss, pain and devastation, we remain grateful for the government and other agencies that are trying their best to provide immediate aid in Palu. We’re also thankful for the international community for raising funds for support, including local volunteers who are pitching in to help. I’m grateful that my fellow Indonesians remain positive, despite this painful experience. I know that in due time, together, we will rebuild Palu again. Sabtarina Dwi Febriyanti, Area Programme Manager of World Vision's Wahana Visi Indonesia, is one of the survivors of the devastating Indonesia earthquake and tsunami.